This review was written for the excellent site PopMatters, which covers movies, TV, and other aspects of pop culture. You can check out the original post at this link. Entering its second season, Stargate Universe (SGU) faced an uncertain future after a promising, yet deliberately paced first season. The SyFy network had shifted the young series to Tuesday nights—directly against the juggernauts of the big networks. Premiering in the fall, it wouldn’t have the luxury of matching up against less popular summer fare.If the ratings weren’t stellar from the start, there might be a serious risk of cancellation. The previous shows in the franchise, Stargate SG-1 and Stargate Atlantis (SGA) , lasted ten and five seasons, respectively. But the changing TV environment and an itchy trigger finger from SyFy likely caused sleepless nights for the SGU producers. Unlike its predecessors, SGU focused less on fast-paced adventure and more on character development, which alienated some of its devoted fans. They posted vitriolic comments on message boards and hoped for the new show’s demise. This approach seemed counter-productive, especially since the franchise’s overall future was depending on SGU. Admittedly, the first group of episodes was pretty slow, but they also included excellent visual effects and interesting characters. During the opening season, the writers tweaked the format and built an effective formula by the end of the year. The second season promised to improve on this model and expand the universe to greater heights. Here’s a brief synopsis of what’s happened so far: A group of mismatched military personnel, scientists, and other civilians from Earth are stranded unexpectedly aboard the Destiny, an ancient ship created millions of years earlier. Armed with limited resources, they must discover the mysteries of their new home across the universe before it’s too late. 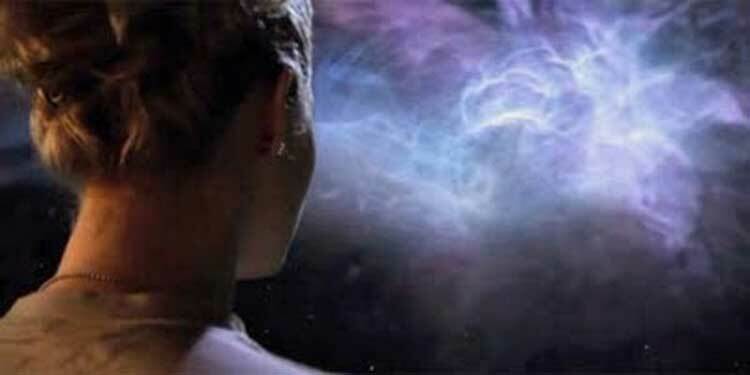 Traveling faster than light and visiting planets through the Stargate, they face strange aliens unlike anything encountered by humans in past explorations. But the biggest threat might come from conflicts within their own ranks as they struggle to find a way back home. The first season ended with one of those cliffhangers that placed nearly every major character (and some minor ones) in serious jeopardy. The enemy in this case was the Lucian Alliance, a band of human-like aliens who boarded the Destiny, seeking its secrets. During the season finale, “Incursion”, this conflict escalates into an all-out war between the two forces that leaves many of the characters injured or facing imminent death at the season’s end. “Intervention” starts the new season right where we left off and delivers more excitement as the battle continues. With one exception, the Lucian Alliance members aren’t exactly evil, which makes the ultimate resolution more complicated. They work under a brutal regime and have a specific goal beyond creating violence and mayhem. One of the major discoveries aboard Destiny occurs during the second episode “Aftermath”. 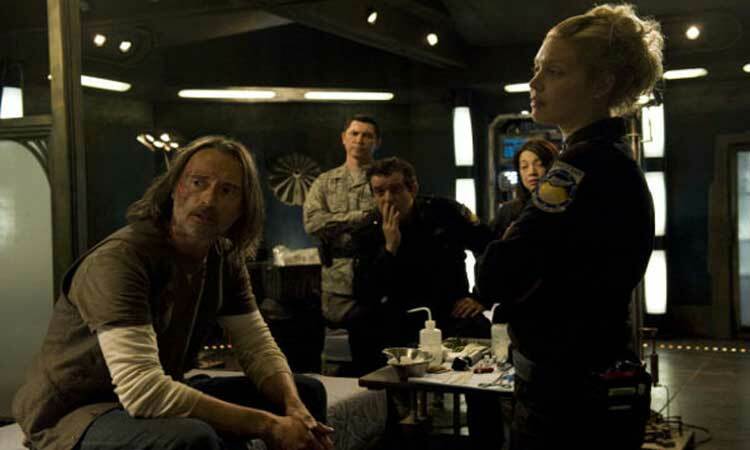 Doctor Rush (Robert Carlyle) unlocks the ship’s master code and locates the bridge that operates navigation and other key systems. Before this point, the crew had a very limited ability to control Destiny and alter its course. Although this is an excellent find, Rush’s choice to keep the bridge a secret from everyone has major ramifications further into the season. This episode also includes the stunning death of a supporting character that was indirectly caused by Rush withholding the truth. This moment plays a key role in the downward emotional spiral of Colonel Young (Louis Ferreira). He’s lost all confidence in his abilities to lead the group and starts drowning his sorrows in alcohol. Young’s struggles come to the forefront down the road in “Trial and Error”, where he’s tested repeatedly in a frustrating scenario that might destroy the entire ship. Unlike its predecessors, SGU takes its time and builds long-term story lines that might not pay off until much later. Don’t get me wrong. I love both SG-1 and SGA and still enjoy those episodes years later. However, they used a more episodic style that differed from the serialized narratives of this series. A good example is Chloe’s (Elyse Levesque) ongoing arc, which goes back to the middle of the first season. Alien villains experiment on her, which causes both physical and mental changes over the long run. In “Pathogen”, Rush makes a daring attempt to excise the growing alien influence over her body, but it’s not successful. Nearing the mid-season finale, Chloe is losing control over her mind and may slip away from them forever. Honestly, I’m not a big fan of this story line, which nearly grinds the pace to a halt every time it becomes a major part of the episode. Levesque gives it her best shot, but the progression happens so slowly that seeing characters talk about her changes becomes tiresome. The writers struggled to find the right place for Chloe in the early episodes, so giving her a more important role is refreshing. However, the downside of dragging her evolution on for so long is that it becomes tedious. I was ready to scream “She’s dangerous! Get rid of her!” at the screen well before the arc was resolved. The big moments are exciting, but it takes us way too long to move the story forward. Adding new characters from the Lucian Alliance also gave the writers a chance to develop romances between the arrivals and regular crew members. Both examples are very well-done and involve strong performances from the recurring actors. Varro (Mike Dopud) helped the gang’s attempts to take over Destiny, but he played a key role in saving Young and the entire group of Earthlings. While slowly becoming part of the group, he develops the touching beginnings of a romance with T.J. (Alaina Huffman). Dopud made a guest appearance on SGA as a different character, and he fits well in this world. The other figure is the attractive Ginn (Julie McNiven), a red-haired scientist who makes a connection with Eli (David Blue). Their romance is short-lived, but it offers a much-needed connection for Eli, who spent the first season pining for Chloe. Unfortunately, Ginn is also involved in one of the season’s most troubling scenes at the end of “The Greater Good”. Although they’ve created strong female characters, I’ve found that the Stargate writers tend to revert too much into the “woman in jeopardy” scenario. They pretty much throw every female character through the ringer this year and deal out murder, blindness, threats towards a baby, and other brutal events. It’s not like the guys are off the hook, especially Young and Rush, but certain moments do approach uneasy territory. On the other hand, these actions from the end of “The Greater Good” lead perfectly into the thrilling next episode “Malice”. Since the arrival of the Lucian Alliance, Simeon (Prison Break’s Robert Knepper) was the one guy who refused to cooperate and become part of the crew. After dealing a vicious blow to Ginn and others, he escapes to a desert planet with weapons in tow. 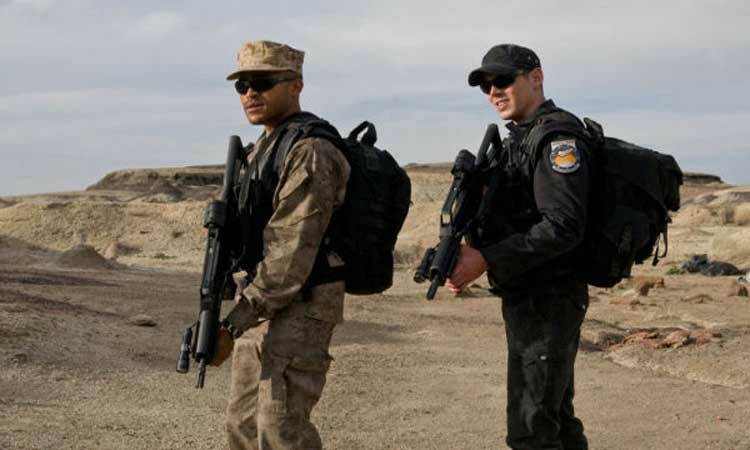 With a personal stake in revenge, Rush joins the soldiers Scott (Brian J. Smith) and Greer (Jamil Walker Smith) to pursue Simeon. They’ve been tasked with capturing him alive because he has key information that could save Earth. But Rush has other ideas. This cat-and-mouse story from Robert C. Cooper feels more like a gritty western than a sci-fi tale. Cooper tends to direct some of the franchise’s most unique episodes, with recent examples being SGU’s “Time” and SGA’s penultimate episode “Vegas”. Both go beyond the expected formula from the series and rank among the best of their seasons. This season’s second half begins in “Deliverance” with a resolution to Chloe’s saga (finally!) and Destiny facing a multitude of strange alien drones. By this point, the announcement had been made — SGU would not return for a third year. This was disappointing because these arcs weren’t designed to finish the Destiny’s story. I’m guessing this wasn’t a major surprise for the producers given the ratings for the early episodes. However, it was still disappointing because the show had really found its way by this point. A prime example is “Twin Destinies”, which uses the familiar sci-fi tropes of time travel and alternate versions of the same characters. Although it could fail miserably, it actually works and leads into more great stories further down the road. One benefit of having 15 seasons in this world is a wealth of entertaining characters that could appear on SGU in the right circumstance. The danger is finding a way to involve them in this story without making it feel like stunt casting. In “Seizure”, David Hewlett and Robert Picardo reprise their roles as Dr. Rodney McKay and Richard Woolsey from SGA. I wondered about this choice because McKay generally provided the comic relief in that series and was a larger-than-life character. Hewlett was highly charismatic in the role and my favorite character in that show. Thankfully, Writer Remi Aubuchon finds a way to keep McKay’s spirit intact while dialing back the quirks for this more serious format. I would have enjoyed seeing what Hewlett or another effective actor from a previous show could do with a recurring role in this show. This episode also has a guest appearance from a stern Victor Garber (Jack Brisco! ), who brings stature to virtually anything he touches. Easily the season’s best episode is “Epilogue”, which appears only a few episodes from the end. Although it mostly focuses on alternate versions of the main characters, it actually would have worked perfectly as the series finale. The premise involves our Destiny crew meeting the ancestors of their alternate selves that were originally discovered in “Twin Destinies”. They met these descendants in the preceding story “Common Descent”, but the follow-up is the true gem. They discover lengthy videos of key moments in the lives of the alternates, who lived out their lives after being stranded on a planet. On paper, this seems like a terrible idea, but it actually is very emotional from start to finish. I have to admit that it got a little dusty in the final scene, where an old Camille Ray (Ming Na) addresses their descendants. It’s a wonderful story from Writer Carl Binder and Director Alex Chapple and reveals the missed promise of another season. For its finale, SGU shies away from the expected action-packed cliffhangers and delivers a solemn, effective conclusion. In an interview after the show ended, Creator Brad Wright revealed that this episode was set up to work as either a season or series finalé. It doesn’t conclude the Destiny story or include any major revelations, but the main characters get a final chance to shine against overwhelming odds. It would have been excellent to see a proper end for SGU, but it doesn’t rank among the soul-crushing ends that we’ve seen with some other cancelled series like Farscape (before the miniseries). This collection includes commentaries on all 20 episodes. It’s nearly impossible to complain about this coverage, but I did find a few of the conversations to be fairly dull. It’s refreshing to see so many of the main actors taking the time to participate, but their involvement could be a double-edge sword. The discussions sometimes veer into “great acting” and “I love this show!” instead of interesting stories from the set. The inclusion is still definitely worthwhile, but striking a balance between the actors and crew members could have worked out better. Along with the commentaries, there are 26 featurettes covering specific elements of the season. These pieces run just shy of 140 minutes, so it’s great to see more than two hours of extra content from the cast and crew. Many last only two or three minutes, but they usually cover at least a few engaging points during that timeframe. One great example is “SGU welcomes you to New Mexico’s Bisti Badlands”, which offers a 20-minute look at the shooting of “Malice” at a desolate place that looks like an alien planet. Cooper provides an introduction about their plans for shooting in New Mexico, and interviews with actors like Robert Knepper provide some exciting background. A sillier entry is “Pitches: A Journey of Friendship and Discovery”, which features Patrick Gilmore and Peter Kelamis. Their characters (Volker and Brody) typically have the best one-liners, so it makes sense that the actors would participate in this tongue-in-cheek segment. It shows them trying to write an episode script, with comedic results. Lou Diamond Philips (Telford) makes a goofy appearance wearing no pants, which matches the tone of this entry. The Stargate DVDs always include good content, but I do have one minor issue with the composition of these featurettes. Considering the small running time of many, it would have made more sense to provide them in a feature-length documentary. They could still offer the option to select each one individually, but combining them into one selection would be easier. The only example of a Play All feature is the “Deconstructing Destiny” piece, which stars Patrick Gilmore and last 27 minutes. There are seven individual entries on Power, Weapons, and other parts of the ship. While we are given the option to watch all of them at once, each item still includes credits, which doesn’t really make it a full documentary. On the whole, though, the extras still provide impressive details for devoted fans. SGU never earned great ratings or critical acclaim, but it still provided 40 episodes of excellent sci-fi storytelling. Arriving so close to the end of Battlestar Galactica, this series suffered by comparison and was dismissed by many (including Stargate fans) as derivative. It’s not a perfect series and has always encountered pacing issues, but it represents a compelling evolution for the franchise. I would have loved seeing where the story would have gone next. Do you hear that SyFy? How about a mini-series? Heck, I’d take a two-hour movie. The Stargate franchise appears dormant at this point, but I’m holding out hope that either a continuation in some format or a new series will keep this universe alive. As always Dan.. I loved reading this.. And it was and always be a true pity the show had to end the way that it did. Thanks David! I actually wrote this one back in 2011 for PopMatters and sometimes forget that I did it. The ending bothers me less each time I watch it, as it's a graceful way to end (unlike a full cliffhanger like Dark Matter had). Even so, I would love to spend more time with these characters.